The curved surface of this stylish acrylic palette helps to open out the fans on the strip, making it easier than ever to create volume fans AND take single lashes from the strip! The chic, modern design makes this palette a beautiful component of any lash salon with any decor. The transparent design makes this palette amazing for working with lashes of all colours by increasing the visibility of the lashes against any surface you place the palette on. Small and super light, this palette is perfect for placing on the London Lash Memory Foam Pillow without taking up too much space, and is the perfect addition to your London Lash Carry Bag without weighing you down. 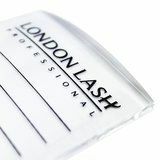 Need advice about London Lash Acrylic Palette?